Kiwi Pundit: When a fugitive German "poisons" elections to unseat a Jew… and it backfires. When a fugitive German "poisons" elections to unseat a Jew… and it backfires. It is a pity the way NZ Election has featured. Every man and his dog has been trying to blame Cunliffe for the historical win for National, which even surprised Key. Labour caucus, which appears to have a happy-trigger, please before apportioning blame, look at yourself first and YOUR DEVIDED HOUSE. You have already let us down – please accept the view of people, and do not let us down again. Please allow Cunliffe to complete his unfinished job of sitting in the back seat of Prime Ministerial BMW. You need to sort out your difference, without hanging your dirty lined in public. Stop tearing yourself apart. 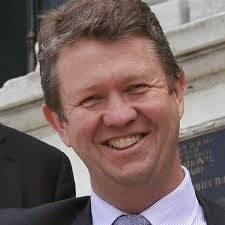 DAVID CUNLIFFE - He should be given an opportunity by Labour caucus to finish his job, climaxing as Prime Minister Caucus in a divided house with some MPs with a lackadaisical attitude to shadow ministry, doing nothing, is equally responsible for the current plight of Labour. If Cunliffe goes, they should bear collective accountability and forfeit their positions as well. Read this article and contemplate on what no mainstream journalist has propagated. But a nondescript ethnic media commentator hazards to claim that there were outside forces beyond anybody’s control (with your collective internal deficiencies) which contributed to Labours thrashing at the polls. Please do not make Cunliffe a scapegoat of something that is collective weakness of Labour within the caucus. Read on…..
Congratulations to the Team Key for their historic win – the first time in history when a government for a third term retained power with an increased best ever results, with an unexpected thrashing for Labour. It appears, nobody could really explain this phenomenon in the results, which appeared to have shocked most people, including the victors. We had an election scenario where Bill English could not give details of any new economic spheres, where David Cunliffe seemed to have drawn, if not being the overall winner, in leader’s debate; where National had a lacklustre campaigning with nothing outstanding, and we had muddied waters and distractions favouring opposition. In such a situation Labour and its coalition were expected to just make it. Surprisingly, it was a disaster, a historic third term loss. What caused this historic win for Key? How come I have all the Aces and Queens, but John Key is still the King? 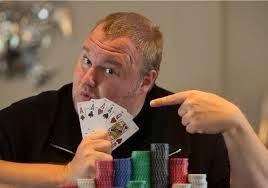 The big fat German, Kim Dotcom, with the power of money obtained via questionable activities, thought he was King. How badly he had judged New Zealand public? The answer, among others, lies in the White Flight from Labour to National. People should realise that some 3 million of New Zealand’s population is of European descent (White, Anglo Saxons), which accounts for some 69% of our population of around 4.4 million. Hence, proportionally, this also comprises over 1.5 million “White “or some 70% of total voters. And when John Key proclaimed that some million voters gave party preference to National, he was perhaps correct. But what he failed to inform was that he himself was surprised with the unprecedented and unexpected shift from left. The win was a miracle in form of some external forces that never existed or occurred within the weeks of past elections. The German, Dotcom (right) and the Jew, Prime Minister John Key( who traces his lineage to a Jewish family). 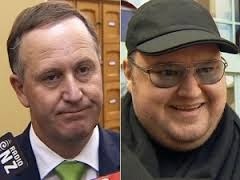 Dotcom's hatred for Key blinded him to the fact that politics was not for sale in New Zealand. After his failure, he admitted that he had poisoned the electoral system and the party he propped up, where Hone Hariwera was a casualty, among others. Firstly, never in the history of New Zealand elections did we have a German fugitive (Dotcom) trying to poison and unseat a Jewish Prime Minster (Key). In the rebound and the consequent electoral Holocaust, we witnessed genocide of Internet Mana, Conservatives and part of the Maori Party, with Labour party and coalition suffering the collateral damage of the White Flight. The Moment of Truth, which was supposed to be an explosion, boomeranged into a bomb-out situation of phus phus…s and putt…putt...putter. 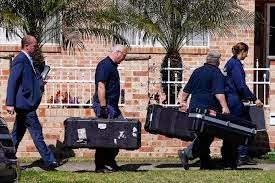 On the heels of claims of mass spying by Government Communications Security Bureau (GCSB) came the Australian terror raids on home-grown Islamic terrorists associated with ISIS, so close to home. Terror raids in Australia, unearthed through their successful spy agency work on the terrorists. This backfired on Dotcom who was trying to paint an evil picture of spying, when Australia was saved by it. The terrorists were reportedly at the final plans of beheading to spread terror in Sydney and Brisbane. They were unearthed because of an effective spying agency, which Internet Mana Party (read Dotcom) was trying to curb in New Zealand. In absence of such spying, Australia would have seen mayhem and possible bloodbath by ISIS terrorists. Many Kiwis felt they were prepared to sacrifice their privacy in exchange for security and safety from this type of terrorism. Just coming on the eve of NZ elections, this incident made Kiwi voters feel secure with Key: cautious mass spying, maintaining status quo and erring on the side of caution against erosion of privacy. Hence they milled around to support Key when he was under threat from “outsiders.”. The intent of Internet Mana party had a negative effect of consolidating Key’s position – there was White Flight from Labour to avoid having a government propped up by such shady characters. Scotland referendum to stay with the Queen and be part of United Kingdom may have rekindled nationalistic feeling that prompted white flight to National, which is seen as a representative party of people of European descent in New Zealand. The second was the Scotland referendum and possible flow-on effect of rekindled British nationalism with victory of “No” voters. British-origin voters make the largest chunk of National and their potential voters. With National representing largely White right-wing voters, this has some unconscious effects. The publicity and love for mother-Britain flowing from this may have had some ethnocentric effect on British descendants to mill around their comfort zone, which is National. The atrocities of ISIS have helped in the white flight-where especially white voters rallied around whom they felt they could trust and be safe with. They saw these things in National. 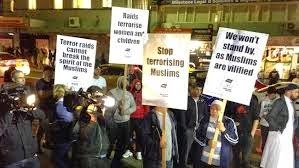 Thirdly, the threat of ISIS and folly of Britain, France and Germany, (and now Australia) with migration of people of one particular religious belief in large numbers gave rise to threat of home-grown terrorism. New Zealand currently have these people in smaller numbers. Nevertheless, this may have prompted the White Flight of people of European descent feeling safer with status quo, Key’s stability and a relatively “clean” characters within National Government and its partners. Fourth is something internal. That is a perception of Labour’s Party nurturing and treating beneficiaries as a possible vote - bank. Working people and small business owners are against Labour’s soft stance on beneficiaries and people who use unemployment as a lifetime occupation. While they (taxpayers) are working hard and paying taxes, they claim these people have parties, make babies, get high on alcohol and drugs, kill babies, and commit crime in their lifestyle of waste. Labour is accused of cultivating a welfare state. Voters have positively viewed and approved National’s strong-arm tactic in pushing such people into employment. The threat if ISIS helped people seek refuge in their comfort zone. Finally, Labour to me seems to have had a very wanting and ineffective media and communication strategy, if they had one. Right-wing blogs had field days in tarnishing image of Labour while they do not appear to have any ammunition to counteract those character assassination, from “the smiling assassin” and associates. It is one thing to have policies, it is quite different to sell and protect them against dirty politics. Labour can relax a little in the knowledge that election results were buoyed by some factors beyond their control. But they cannot blame others for internal infighting, poor management and administration issues discussed above. Labour also need to sort out the revival of ABC (anybody but Cunliffe) team and division among itself that appears to be a common knowledge. There is a year to sort things out and prepare for a victory for the next two years. I suggest as per majority opinion polls, David Cunliffe has to continue as the leader to consolidate his position. Like Gordon Tietjens who has taken NZ Rugby Sevens to ups and downs for over a decade, without being fired for a loss, I feel Cunliffe has much potential and experience curve to deliver. Anyway, I cannot see anybody in the lengths and breadths of Labour Party who could spar with an experienced John Key in any skills as a leader, as Cunliffe has done. Hence, with Cunliffe, and with a bit of damage-control, media strategy and coaching, Labour has the best chance to counteract dirty politics, and match experience and acumen of Key, and provide continuity and prospects of victory, come 2017. Please, I plead, resurrect Labour, do not let Cunliffe’s exposure and experience go to waste. If anybody has to go, it is not David – but some of the caucus members who have spent their lifetime in Parliament, and their use-by date is over. Ask Chris Carter-he has already spoken on this. Please make way for younger blood and new generation to take over the party. Labour Party (like National has done), needs new blood to rise from the (almost) dead.